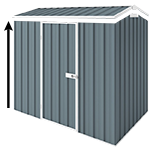 The StoreMax 7x7 is the newest addition to the Duramax quality range of vinyl sheds. The StoreMax 7x7 is an attractive vinyl shed with heavy duty thick interior beams and columns. This durable unit will add beauty to any backyard or outdoor garden area. PLUS it is maintenance-free! It's rot, dent, fade, mildew, water, and bug proof! This addition enhances our line of quality and affordable Vinyl Sheds. *Add a FREE Resin Sigma Shelf? -- Please Select --YES! I'd like my bonus Sigma Shelf. NO thank you.